Few diamonds have the rich and complicated history of the Agra diamond, named after the famed Indian location of the Taj Mahal. Even before the Taj Mahal was built the story of the Agra had begun. In 1526 Babur, the first Mogul emperor sacked the city of Agra. After the battle he sent his son to secure the city. In doing so his son, Humayun, captured the family of the slain former ruler. By sparing their lives he was given a great cache of jewelry and the Agra is said to be a part of this group. It likely stayed in the hands of the Moguls for the next 300+ years (with perhaps a quick detour to Persia). But what is agreed upon is that in the mid-19th century the diamond made its way to England. The story (as described by Lord Donegall) is that the diamond was captured by a lieutenant in the British cavalry. The regiment spent a good deal of time trying to figure out a way to smuggle the diamond back home. The final plan was for the Agra to be within the stomach of a horse that was made to swallow the diamond. When the horse foundered on the day it was to board a ship England the diamond was cut from the horse’s stomach and brought aboard the ship. Why it was ok at that point to simply bring the diamond aboard is unexplained. However it came to England its next stop was with a famous British gem collector. In a catalogue of gems owned by the Duke of Brunswick in 1860 the Agra was described as the 14th most important diamond in the world. One must wonder what the others were. In the late 1800’s the Agra was re-cut to 31.41ct. It changed hands a few times in the ensuing years. In 1909 it was sold at an auction of the gems of Salomon Habib. There were only 8 gems in the auction, one was the Agra, another the Idol’s eye, and finally the Hope. Three amazing natural color diamonds from India with unquestioned provenance in one auction, one can only imagine the furor that would cause today. The Agra diamond as a gem itself is notable for a number of reasons. Its current cut (it has been repolished in the past 20 years) is reminiscent of older cushion shaped diamonds and evokes its Golconda heritage. A type IIa diamond, the pink color is quite strong, it was graded as Intense Pink by the GIA. As with many large type IIa diamonds the transparency is especially dramatic without any haziness. Its size alone(now 28.15ct) is very rare for a pink diamond, and this along with its history, shape, and amazing color combine to make the Agra one of the world’s most important and fascinating diamonds. The Allnatt – One Of The Most Significant Yellow Diamonds In History. in history.” The diamond was named after its former owner, Major Alfred Ernest Allnatt (1896-1969) a businessman, philanthropist and collector of art and natural color diamonds. Major Allnatt commissioned Cartier to make an extremely unique five petal flower brooch which is still used to showcase the diamond today. 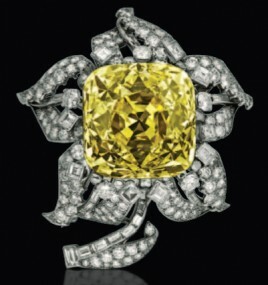 In 2000 the diamond was graded by GIA as a fancy vivid yellow, and at the time it was the largest vivid yellow diamond graded by the laboratory. The Allnatt was later on display at the Smithsonian in 2003 as part of the “Splendor of Diamonds Exhibit” alongside the Steinmetz Pink, The Heart of The Eternity, The DeBeers Millenium Star, The Pumpkin Diamond, and The Moussaieff Red. Beyond its impressive size, The Allnatt’s charm is derived from a well-made cushion modified brilliant cut with a French-style culet.The combination of eight large pavilion main facets and a unique arrangement of the star facets create an impressive mosaic of the stone’s vivid color. The Allnatt currently resides in New York’s diamond district with a collector who would like to remain anonymous at this time. Blog Courtesy of The Natural Color Diamond Association.